Announcing Five Star Comics #2! Five Star Comics #2 is now in print, and it's so new, it's still warm to the touch. (If you don't believe us, just put your finger to the image on your screen.) 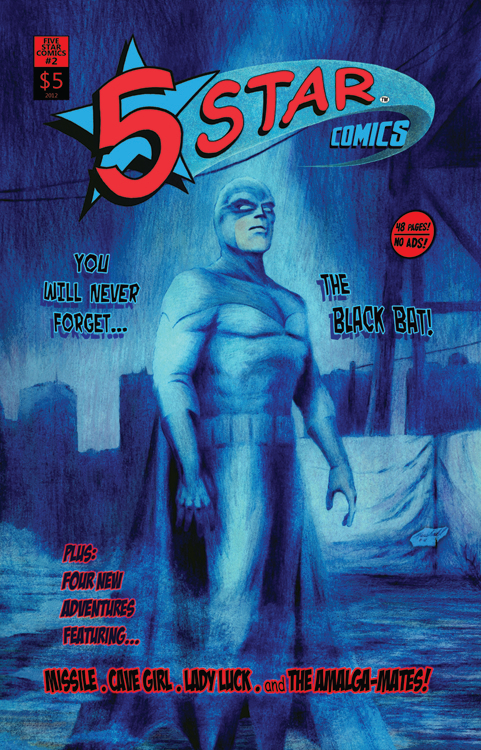 The second issue includes five new stories from five creators, including Matt Marshall (The Black Bat), Larry Blake (Missile), Gary Gibeaut (Lady Luck), Tim Corrigan (The Amalga-Mates), and Terence Hanley (Cave Girl). Buy it at all our events this year or by writing to Larry Blake. See the Order Form page on how to do it.